Cajun is the son of Silhouette ( Ch. 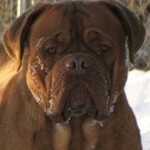 Sheba de la Vallee de Goliath) and has some top amazing dogs in his pedigree. Like his mother he has such a sweet loving nature with a twist of the always up to no good and looking innocent at the same time. He has always produced awesome bone and wrinkle in his offspring and has also produced many Champions!!! I find Cajun reproduces himself and in my books that is a wonderful thing!! !